Attorney.org recognized Utah DUI Attorney Law Blog (www.utahduilawblog.com) as one of the top criminal law blogs on the net. The ranking seems to be alphabetized, rather than a rank of the best to worse. The link is http://www.attorney.org/criminal-law.html. Attorney.org seems like a site that reports on current legal issues, items in the news, and seems to help people find competent lawyers. 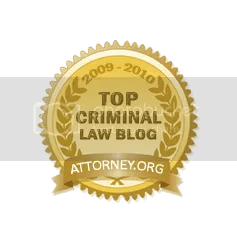 The site does not just focus on criminal law, but seems to focus on many areas of law including malpractice, criminal law, divorce, civil, bankruptcy, tax, and many more areas. It seems to be a good place to start. ‹ What happens when an Officer Hides Evidence, and Gets caught in a Utah DUI? Congratulations on your accomplishment. it is well-earned and speaks well of not only your legal talent, but your writing skills. SEEMS like a pretty big achievement! Congratulations! Wow – congratulations. I understand how difficult this is to achieve and applaud you on your accomplishment. Great job I can see why you got this award you have a really great blog with interesting post. Congratulations. Congratulations on a successful blog. It’s an awesome thing when a DUI lawyer is interested educating people on current events and all types of law.